"I was a victim of campus sexual harassment," one person wrote. "It is clear the proposed rules would not protect students"
Education Secretary Betsy DeVos speaks about campus sexual assault at George Mason University on Sept. 7, 2017. Education Secretary Betsy DeVos' proposal to rewrite how universities handle complaints of sexual assault and misconduct had already sparked strong rhetoric from assault survivors and civil liberties groups when she first announced an overhaul in 2017. With the conclusion Wednesday of a 60-day public comment period, NBC News reported, the Federal Register noted that almost 103,000 letters and messages were logged online — revealing just how passionate people remain on either side of the debate. An official with the American Council on Education, higher education's biggest lobbying arm, estimated the volume of submissions would total 20 times what is typically received for a major regulatory proposal, according to The Washington Post. 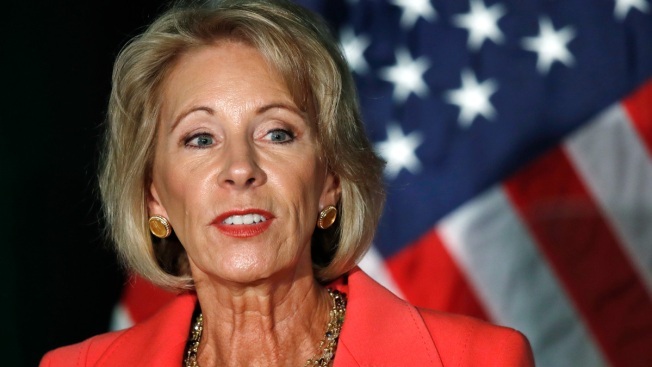 Most of the comments appear to oppose the Department of Education's reworking of the federal guidelines known as Title IX, which prohibit gender discrimination, including sexual assault, on college campuses as well as in primary and secondary schools. "I was a victim of campus sexual harassment," one person wrote. "It is clear the proposed rules would not protect students from sexual harassment."